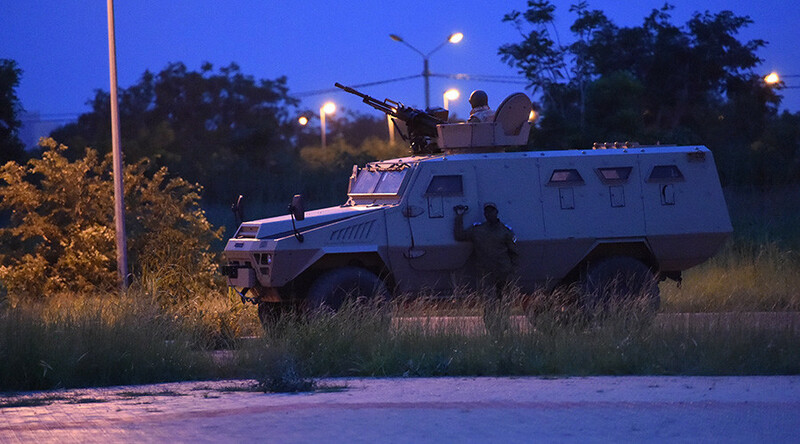 At least 17 people, including foreigners, were reportedly shot dead as suspected Islamist militants attacked a Turkish restaurant in central Ouagadougou, the capital of Burkina-Faso, and started a gun battle with the military. The place, identified as Aziz Istanbul restaurant in the city center, was “attacked by suspected jihadists,” AFP reported, citing a restaurant server. Three of the perpetrators have been killed by security forces, Communications Minister Remi Dandjinou confirmed to state TV on Monday, as cited by Reuters. He did not elaborate on how many attackers were involved in the assault. “They are confined to one part of the building they attacked. Security and elite forces are conducting an operation,” he said earlier. Earlier Dandjinou confirmed that at least 17 people have been killed and eight others injured in attack in the capital, Ouagadougou, Burkina 24 reported him as saying. AFP reported, citing an unnamed army officer, that the hostages were taken on both floors of a two-story building, with the restaurant located on the ground floor. Fuzzy footage of nighttime streets with heavy gunfire being heard has surfaced on social media. Some pictures showed presumed survivors of the attack. A witness told Reuters that he saw customers running out of the restaurant, with security forces surrounding the area. RFI reported, citing witnesses, that three people drove to the café before going on a shooting rampage there. Local MP Allassane Sakandé reported “a dozen wounded” and “several dead” as a result of the shooting, as cited by Radio Omega. The director of Yalgado Ouedraogo Hospital in Ouagadougou, where the victims of the attack were taken, reported that at least three people had died and 11 others were injured in the assault. The troops have reportedly stormed the café but the fate of the attackers was not immediately known. Meanwhile, Communications Minister Remi Dandjinousay said the authorities are not ruling out that the incident was a terrorist attack. The central street where the Turkish restaurant is located has several luxury hotels favored by foreign visitors, including the nearby Hotel Bravia and the Splendid Hotel. The Splendid was the target of the January 15, 2016 terrorist attack, in which Al-Qaeda-affiliated militants cold-bloodedly shot or took hostage some 200 people. Some 176 hostages were released, over 50 people were injured and 30 died. The slain victims included citizens of 10 foreign countries, including Canada, Ukraine, France, Switzerland and the US. Abdoulaye Diop, Mali's foreign minister, expressed solidarity with the people of Burkina Faso on Twitter, calling the shooting incident “a barbarian act of terrorism." Mali, which borders Burkina Faso, has been battling a jihadist insurgency in its northern and central regions for years. In June, jihadists stormed a luxury resort in Bamako, the country's capital, taking dozens of hostages and killing five people.